Ernest Dichter is a name every marketer should know. Early on in the writing of THE PASSION CONVERSATION we stumbled upon a long-forgotten Harvard Business Review article titled, “How Word-of-Mouth Advertising Works.” It was published in 1966 and we couldn’t help but think how much further along the marketing world would be if it had heeded the article’s advice. Ernest Dichter wrote the article. Dichter, who you ask? ERNEST DICHTER is a name every marketer should know. He was an Austrian-born psychologist who spent a lifetime studying human motivations and applying it to marketing brands. He’s known as the father of motivational research and credited with coining the term, focus group. 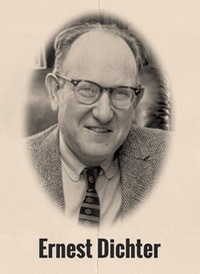 Dichter’s pioneering research techniques and analysis changed the way that giants like Chrysler, Procter & Gamble, Exxon, General Mills, and DuPont sold products to consumers. His advice to the prestigious clients was essentially to humanize the brand in order to connect better with people. Psychobabble it wasn’t. It was indispensable marketing advice then, today, and tomorrow, no doubt. Let’s revisit Ernest Dichter’s seminal (yet slept-upon) Harvard Business Review article from 1966 on Word-of-Mouth Advertising. Steeped in his in-depth research on consumer motivations, Dichter’s article explained consumers reject advertising messages because they are “more a sales tool than information and guidance.” He goes on to explain consumers reject advertising claims because they feel “threatened” by the “cold commercialism” of advertising messages. Whoa! Where’d that knowledge go for the last half-century? Imagine how much further along we’d be if more marketers in 1966 had taken note of Dichter’s smart findings on the importance of humanizing brands. In this article, Dichter goes deep into in reviewing the psychology of word of mouth recommendations by outlining the motivations for why people talk about a product/service. He also lists the motivations for why people listen to and act on a recommendation. Keep in mind, the following marketing perspective is nearly 50 years old. Reading it now feels like we’re going back to the future of marketing. Dicther’s research revealed that a person will talk about a brand if he “gets something out of it.” Meaning, the talker receives self-satisfaction from mentioning a product or service to someone. In particular, Dicther outlines four motivations for why people talk about a brand. Dichter writes about the critical factor of having an “A-ha” experience for people to act on a word of mouth recommendation. His analysis explains how mass advertising fails to effectively produce “A-ha” word of mouth experiences. Instead, Dichter reasons that a “… recommender is often much more capable of establishing … a dialogue of conviction … [leading to an] A-ha experience” than is traditional advertising. It’s amazing this article is nearly 50 years old. So much of Dichter’s word of mouth marketing analysis rings true today. As mentioned earlier, imagine how much further along we’d be if more marketers in 1966 had taken note of Dichter’s smart findings on the importance of humanizing brands to spark word of mouth marketing conversations. SOURCE: Dichter, Ernest (1966), “How Word-of-Mouth Advertising Works,” Harvard Business Review, 44 (November/December), 147–66.